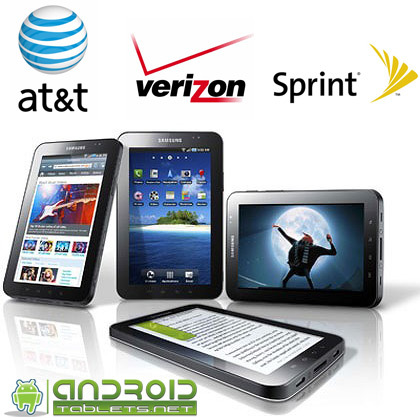 Samsung Galaxy Tab for the 3 large wireless carriers? Discussion in 'Android Tablet News' started by Admin, Sep 13, 2010. The Android Tablet scene has exploded in the past 40 days. We've seen hundreds of different tablets come out from players large and small. However, none of them really had that feel of 'polished product' yet -- however, we've seen some glimmers of products coming out in the future that we believe will have the polish to truly put them into the market to compete against the iPad. The first product to come out that will do this? The Samsung Galaxy Tab. The great thing about Samsung is that they have shown an understanding of this market. It's not enough to have good hardware, you need the software too. In addition, good hardware and software won't sell your product if the customer can't buy it... or if the customer doesn't have coverage. With that knowledge they've decided to manufacture the Samsung Galaxy Tab with an impressive hardware list. The tab will also be running Android 2.2 out of the box, the latest and greatest available from Google. Sounds like enough? Well, not if you ask Samsung. According to the Wall Street Journal they will also be selling multiple Tab versions that work on all 3 of the big carrier networks: Verizon Wireless, Sprint Wireless and AT&T Wireless. With hardware, software and great coverage you can't go wrong. We hope to see Samsung rewarded for this bold move and a great push to really get Android in the hands of as many people as possible in a format that they want.